Fixed income investments generally provide investors with more secure and stable investments than equity, property or other growth orientated and therefore more risky investments. A very common form of fixed income investment is a bond. The Australian government, state governments and many of Australia’s largest companies borrow money by issuing bonds. If a company wants to borrow money for a number of years it can do so in one of two ways; it may borrow from a bank, or the company can issue corporate bonds. 2. The steady stream of income paid over the life of the bond defined by the coupon. Companies can vary in their financial strength, depending on the business they are in and how much money they have already borrowed. This is the nominal value of the bond, which the company promises to pay when it matures. This is the annual income that is paid to investors, expressed as a percentage of the Face Value. When bonds first existed in paper, investors would detach the coupon for that payment and take it to the company’s bank to receive payment. These income payments are usually paid semi-annually or quarterly and occur on set dates. This means bonds allow investors to accurately plan when and how much income they will receive from their investments. Our Cash Flow Tool allows you to map out payments from a single XTB or a portfolio of up to 10 XTBs. Alternatively, select one of our XTB Starter Portfolios and let us do the work of selecting for you. A bond with a $100 face value and a 5% coupon, paid semi-annually will provide two payments of $2.50 each year. Note: In general, a riskier company will issue bonds that have a higher coupon than a less risky company. The asset class that includes bonds is ‘fixed income’. It is true that many bonds have a coupon that is fixed. However, some have a ‘floating’ coupon pegged to an industry benchmark and offer investors a fixed margin above that benchmark. For example a floating coupon bond may track the Bank Bill Swap Rate (BBSW) and offer investors 0.75% above this rate. In this case the coupon would be BBSW + 0.75%. Check out the full range of available XTBs, including fixed and floating rate bonds. This is the length of time from the bond being issued until its maturity, when the face value and the final coupon are paid to investors. When you invest in a company, it is important to understand where you sit in the capital structure. In the event the company gets into financial trouble, some bonds will be paid out before others and before shareholders. XTBs cover senior corporate bonds which sit above subordinated bonds, which are above hybrid securities then equities. The lower the ranking in the capital structure a security is, the higher the risk and potential reward associated with that security. 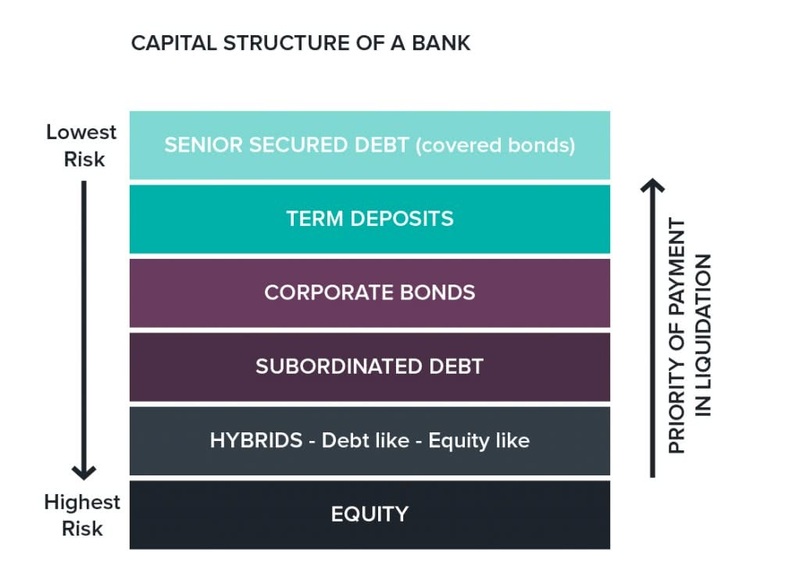 An important practical and day-to-day implication of where senior and subordinated bonds, hybrids and shares sit in the capital ranking of a company is the price stability or volatility of the security in the market. Senior bond prices/yields are generally far less volatile than securities below them in the structure such as shares and hybrids. This is important when it comes to the stability of your diversified portfolio. Read more about capital structure and it’s importance to investors. Read more insights into the corporate bond market in our insights centre. Giving you access to the benefits of Corporate Bonds, XTBs deliver predictable, regular income from an investment of as little as $1500. Use our unique Cash Flow Tool to build a portfolio of XTBs and visualise your income in 3 easy steps.